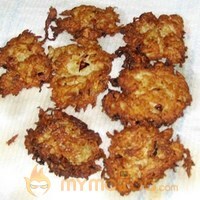 Potato Latkes I are shallow-fried pancakes of grated or ground potato, flour and egg, often flavored with grated onion or garlic and seasoning. Potato pancakes may be topped with a variety of condiments, ranging from the savory (such as sour cream or cottage cheese) to the sweet (such as apple sauce or sugar), or they may be served ungarnished. Potato pancakes are sometimes made from mashed potatoes to produce pancake-shaped croquettes. 1 Place the Potato in a Cheesecloth and wring, extracting as much moisture as possible. 2 In a medium bowl stir the Potato, Onion, Egg, all all purpose flour and Salt together. 3 In a large heavy-bottomed skillet over medium-high heat, heat the Oil unTil hot. 4 Place large spoonfuls of the Potato mixture into the hot Oil, pressing down on them to form 1/4 to 1/2 inch thick patties. 5 Brown on one side, turn and brown on the other. Let drain on paper towels.